本发明涉及磁盘用润滑剂化合物、磁盘及其制造方法。 The present invention relates to a disk with a lubricant compound, and a manufacturing method for magnetic disk. 所述磁盘是在基板上至少依次设置了磁性层和碳系保护层以及润滑层的磁盘，前述润滑层含有由结构具有全氟聚醚主链，且在除分子末端以外的位置上具有芳香族基，同时分子的末端具有极性基的化合物构成的润滑剂化合物。 The disks are sequentially disposed on a substrate at least a magnetic layer and a carbon-based protective layer and a lubricating layer disk, the lubricant layer contains a perfluoropolyether structure having a main chain and having an aromatic molecule at a position other than the end group, while the ends of a molecule having a polar group, the lubricant compounds thereof. 本发明涉及一种搭载在硬盘驱动器（以下简称HDD)等磁盘装置上的磁盘、其制造方法以及磁盘用润滑剂化合物。  The present invention relates to an apparatus for a disk mounted on the disk in a hard disk drive (hereinafter abbreviated HDD) and the like, and a method of manufacturing the magnetic disk lubricant compound. 随着近年来信息处理的大容量化，开发了各种信息记录技术。  With the large capacity of information processing in recent years, the development of a variety of information recording techniques. 尤其是，采用磁记录技术的HDD的面记录密度以年率100%左右的比例持续增加。 In particular, an HDD employing a magnetic recording technology in a ratio of areal recording density of about 100% annual rate continues to increase. 最近，就可用于HDD等的2. 5英寸直径磁盘而言，越来越需要其每片超过250G字节的信息记录容量，为了适应这种需求，需要实现每平方英寸超过400G比特的信息记录密度。 Recently, HDD or the like can be used for the purposes of the disk diameter of 2.5 inches, which require more than 250G bytes of recording capacity per information sheet, in order to meet this demand, the need to achieve the information recording 400G bits per square inch than the density. 为了实现可用于HDD等的磁盘的高记录密度，需要在使构成承担信息信号记录的磁记录层的磁性结晶粒子细微化的同时，逐步减少其层厚。 To achieve a high recording density of the disk can be used for HDD, etc., it is necessary that the magnetic recording layer constituting the magnetic crystal grains assume an information signal recorded miniaturization while gradually reducing its layer thickness. 但是，以往已商业化的面内磁记录方式（也称为纵向磁记录方式，水平磁记录方式）的磁盘，其磁性结晶粒子微细化的进展结果是，超顺磁现象导致记录信号的热稳定性受损，记录信号消失，发生热搅动现象，进而成为阻碍磁盘的高记录密度化的主要原因。 However, the conventional commercialized longitudinal magnetic recording (also called vertical magnetic recording method, the horizontal magnetic recording type) disks, which magnetic crystal grains fine progress result, the superparamagnetic behavior causes a signal recording thermally stable impaired, recording signal disappears, the thermal fluctuation phenomenon, and thus become the major reasons that disk high density recording. 为了解决该阻碍的主要原因，近年来，提出了垂直磁记录方式用的磁记录介质。  In order to solve the main reason for the obstruction, it has recently been proposed a magnetic recording medium used for perpendicular magnetic recording. 垂直磁记录方式与面内磁记录方式的情况不同，其被调整成磁记录层的易磁化轴按与基板面垂直的方向取向。 In the case of perpendicular magnetic recording system different longitudinal magnetic recording, the magnetic recording layer which is adjusted to the easy axis of magnetization oriented in a direction perpendicular to the substrate surface. 垂直磁记录方式与面内记录方式相比，由于可以抑制热搅动现象，因此适于高记录密度化。 Perpendicular magnetic recording method than the inner surface, since it is possible to suppress the thermal fluctuation phenomenon and thus is suitable for high recording density. 作为这种垂直磁记录介质，已知有例如特开2002 - 74648号公报中所记载的那样的在基板上具有由软磁体构成的软磁性底层和由硬磁体构成的垂直磁记录层的所谓的双层型垂直磁记录盘。 As such a perpendicular magnetic recording medium, for example, are known Laid-Open 2002-- having a so-called soft magnetic underlayer and the perpendicular magnetic recording layer composed of a hard magnetic body composed of soft magnetic material on a substrate as described in Patent Publication No. 74648 of two-layered perpendicular magnetic recording disk. 可是，以往的磁盘，为了确保磁盘的耐久性、可靠性，在基板上形成的磁记录层上设置有保护层和润滑层。  However, the conventional disk, the disk in order to ensure the durability, reliability, a protective layer and a lubricating layer on the magnetic recording layer formed on the substrate. 尤其是最表面所使用的润滑层需要有长期稳定性，化学物质耐性， 摩擦特性，耐热特性等各种特性。 Most especially the surface lubricating layer need to have various characteristics used long-term stability, chemical resistance, friction characteristics, heat resistance and the like. 对于这种要求，以往，作为磁盘用润滑剂，多采用分子中具有羟基的全氟聚醚系润滑剂。  For such a demand, conventionally, as a disk with a lubricant, the use of a perfluoropolyether lubricant having a hydroxyl group in the molecule. 例如，在特开昭62 - 66417号公报（专利文献1)等中，已公知有涂布了具有在分子两末端有羟基的HOCH2CF2O(C2F4O)p (CF2O)qCF2CH20H结构的全氟烷基聚醚润滑剂的磁记录介质等。 For example, in Laid-Open Publication 62-- Publication No. 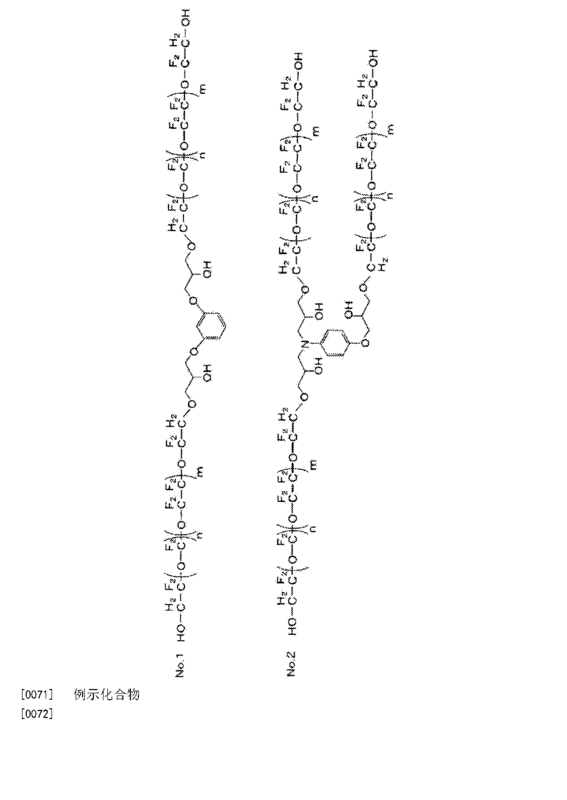 66417 (Patent Document 1), and the like, there is known a perfluoroalkyl polyether coating having a hydroxyl group at both molecular terminals HOCH2CF2O (C2F4O) p (CF2O) qCF2CH20H structure a magnetic recording medium like a lubricant. 已知的是，如果润滑剂分子中存在羟基，通过保护层与羟基的相互作用，就可以获得润滑剂向保护层附着的特性。 It is known that, if the lubricant is present in the molecule a hydroxyl group, the protective layer by interaction with a hydroxyl group, can be obtained the properties of the lubricant adhered to the protective layer. 如上所述，最近的HDD逐渐变成需要400G比特/英寸2以上的信息记录密度，为了有效利用有限的盘面积，HDD的启动停止机构可以采用LUL(LoadUnload:加载卸载）方式的HDD替代以往的CSS(ContactStartandStop)方式的HDD。  As described above, the HDD recently becoming required 400G bits / information recording density of 2 inches or more, in order to effectively use the limited area of ​​the disc, HDD start-stop mechanism may be employed LUL (LoadUnload: loading and unloading) mode HDD alternative HDD previous CSS (ContactStartandStop) mode. LUL方式中，在HDD停止时，使磁头退避到位于磁盘外的被称为坡道（7 >文）的倾斜台，在启动动作时，在磁盘开始旋转后，使磁头从坡道向磁盘上滑动，浮起飞行，进行记录再生。 LUL embodiment, when the HDD is stopped, the magnetic head is retracted to the disk is referred located outside the ramp (7> herein) inclined table, when the start-up operation, after the disk starts to rotate, the magnetic head from the ramp to the disk sliding, floating flight, recording and reproduction. 停止动作时，磁头退避到磁盘外的坡道后再停止磁盘的旋转。 When the action stops, the rotating head is retracted to the ramp outside the disk and then stop disk. 该一连串的动作被称为LUL动作。 The series of actions is called LUL action. 采用这种方式是因为，搭载于LUL方式的HDD中的磁盘不需要设置如CSS方式那样的与磁头的接触滑动用区域（CSS区域），因此可以扩大记录再生区域，有利于高信息容量化。 In this way it is because, in the HDD mounted in LUL embodiment need not be provided in contact with the head disk such as CSS manner as the sliding region (CSS region), recording and reproducing region can be enlarged, in favor of high information content. 这种情况下，为了提高信息记录密度，必须通过减少磁头上浮量，以极力减少间隔损耗。  In this case, in order to improve the information recording density must be reduced by the amount of floating head, trying to reduce spacing loss. 为了实现每平方英寸400G比特以上的信息记录密度，需要使磁头的上浮量至少在5nm以下。 In order to achieve an information recording density per square inch or more bits 400G, floating the magnetic head needs to be at least 5nm less. LUL方式与CSS方式不同，磁盘面上不需要设置CSS用的凸凹形状，可以使磁盘面上非常平滑。 LUL way CSS in different ways, the disk surface need not be provided with the convex-concave shape CSS can be made very smooth disk surface. 因此，由于搭载于LUL方式的HDD中的磁盘与CSS方式相比，可以使磁头的上浮量进一步下降，因此其具有能够实现记录信号的高S/N比化，能够有助于磁盘装置的高记录容量化这样的优点。 Thus, since the embodiment is mounted on an HDD LUL and CSS disk than was possible that the flying height of the magnetic head is further decreased, thus possible to realize a recording signal having a high S / N ratio and a high magnetic disk apparatus can contribute recording capacity advantage. 由于伴随着最近的LUL方式的导入，磁头的上浮量进一步下降，要求即使在5nm以下的极低的上浮量，磁盘也稳定动作。  Since the recent introduction accompanied LUL embodiment, the amount of floating of the magnetic head is further decreased, even if the required low amount of 5nm or less floating, disk operation is stable. 尤其是如上所述，近年来，磁盘由面内磁记录方式过渡到垂直磁记录方式，伴随着磁盘大容量化，强烈需要飞行高度的降低。 In particular, as described above, in recent years, the transition from the magnetic recording disk to the inner surface of the perpendicular magnetic recording system, along with a large capacity disk, the flying height reduction is strongly required. 而且最近，磁盘装置不仅作为以往的个人电脑记忆装置，而且还在移动电话、车辆卫星导航系统等移动用途中大量使用，根据使用的用途多样化，对磁盘所要求的耐环境性变得非常严格。  Also recently, the conventional magnetic disk device not only as a personal computer memory means, but also a mobile telephone, a mobile vehicle satellite navigation system using a large number of applications, depending on the application of the diversification, the environmental resistance of the disk becomes required very strict. 因此，鉴于这种状况，当务之急是进一步提高以往磁盘的耐久性，构成润滑层的润滑剂的耐久性等。 Thus, in view of this situation, it is imperative to further improve the durability of the conventional disk, the durability of the lubricant constituting the lubricant layer and the like. 此外，伴随着近年来磁盘的信息记录密度急速提高，除了磁头的上浮量降低，还需要进一步减少磁头与磁盘的记录层间的磁间隙，并且存在于磁头和磁盘的记录层之间的润滑层需要比以往更进一步薄膜化。  Further, the information recording density in recent years, along with rapid increase of the magnetic disk, in addition to reducing the amount of floating of the magnetic head, requires further reduce the gap between the magnetic head and the disk recording layer, between the recording layer and is present in the head and the disk the lubricating layer further thinner than ever need. 在磁盘的最表面的润滑层中使用的润滑剂对磁盘的耐久性带来大的影响，例如即使进行薄膜化，对磁盘而言稳定性、可靠性也是必需的。 Lubricants used in the lubricating layer in the outermost surface of the magnetic disk to bring a large influence on the durability of the disk, even if a thin film on the disk in terms of stability and reliability is required. 然而，以往分子中具有多个羟基等极性基的极性高的润滑剂，分子间相互作用或极性基之间相互吸引，容易产生润滑剂的凝集。  However, the conventional high attraction between the polar lubricant having a plurality of hydroxyl groups in the molecule polar groups, intermolecular interactions or polar group, the lubricant is prone to aggregation. 产生这种凝集的润滑剂分子体积增大，如果膜厚度没有达到比较厚的程度则难以获得均匀膜厚度的润滑层，由此产生无法实现磁间隙减少的问题。 Produce such aggregate volume of lubricant molecules is increased, if the film thickness is not reached the level of relatively thick lubricant layer is difficult to obtain uniform film thickness, thereby generating a magnetic gap can not be achieved to reduce the problem. 而且，如果对于保护膜上的活性点，润滑剂中存在过剩的极性基，则存在容易产生污染物等的吸引或润滑剂向磁头转移的倾向。 Further, if the protective film for the active site, the presence of excess lubricant polar groups, the tendency prone to contaminants suction or transfer of the lubricant to the presence of the magnetic head. 因此，如果在例如5nm以下的超低上浮量的情况下使用，则成为HDD故障的原因。 Thus, if, for example, in the case of ultra-low flying height of 5nm or less, the cause of HDD failure. 此外，由于伴随着近年来的高记录密度化，磁头的上浮量进一步降低，因此磁头和磁盘表面的接触、摩擦频发的可能性增高。  Furthermore, since in recent years along with the high recording density, the flying height of the magnetic head is further decreased, so that the contact surface of the head and the disk, increase the likelihood of frequent friction. 而且，在磁头接触时，存在不从磁盘表面迅速离开而摩擦滑动片刻的现象。 Further, when the head contacts, the sliding friction phenomenon does not exist a moment rapidly away from the disk surface. 已知的是，现在使用的磁头的滑块中含有氧化铝（Al2O3),前述全氟聚醚系润滑剂的主链CF2O部分容易发生被氧化铝等的路易斯酸分解。 It is known that the magnetic head sliders currently used containing aluminum oxide (Al2O3), part of the main chain easily occurs CF2O the perfluoropolyether lubricant is decomposed Lewis acids such as alumina. 因此，在磁盘表面使用的全氟聚醚系润滑剂，通过与磁头的接触等，主链的CF2O部分被氧化铝分解，相对于以往更容易促进构成润滑层的润滑剂的低分子化。 Thus, in the perfluoropolyether-based lubricant used in the disk surface by contact with a magnetic head or the like, part of the backbone CF2O alumina is decomposed, compared with the previous lubricant was much easier to promote the molecular weight of the lubricating layer. 因此，担心这种被分解而低分子化的润滑剂附着在磁头上，可能给数据的读取和写入带来障碍。 Thus, such a fear of being decomposed to low-molecular lubricant adhering on the head, may cause obstacles to the reading and writing of data. 而且，考虑到不久的将来在使磁头和磁盘接触的状态下的数据的记录再生时，由于经常接触带来的影响更令人担忧。 Moreover, taking into account the data is recorded in the head and disk contact state of regeneration, due to the frequent contact with the impact of the more worrisome in the near future. 而且， 构成润滑层的润滑剂如果低分子化，会丧失润滑性能。 Moreover, if the lubricant constituting the lubricating layer of a low molecular weight, the lubricating performance is lost. 而后，丧失润滑特性的润滑剂转移并堆积到具有极窄的位置关系的磁头上，其结果是，上浮状态变得不稳定，发生飞行静磨擦(fly-stiction)故障。 Then, the loss of lubricating properties and bulk transfer of lubricant to the magnetic head having an extremely narrow positional relationship, as a result, the floating state becomes unstable, flying stiction (fly-stiction) failures. 尤其是，可以认为最近引入的具有NPAB(负压）滑块的磁头，由于通过磁头下面发生的强负压容易吸引润滑剂，促进了转移堆积现象。 In particular, the head can be considered to have NPAB (negative pressure) recently introduced the slider, since the high negative pressure occurs under the head tends to attract lubricant, promoting the transfer of accumulation phenomenon. 转移堆积的润滑剂有时会生成氢氟酸等酸，有时会腐蚀磁头的元件部分。 Bulk transfer lubricant may generate hydrofluoric acid and the like, may corrode the magnetic head element portion. 尤其是，搭载磁阻效应型元件的磁头容易被腐蚀。 In particular, the magnetoresistive effect element mounted on the head easily corroded. 这样，就要求实现润滑层长期稳定性优异，在伴随着近年来高记录密度化的磁间隙减少和磁头的低上浮量的条件下具有高可靠性的磁盘，而且，由于使用的用途的多样化等，对磁盘所要求的耐环境性变得非常严格，因此与以往相比，还更需要润滑层的薄膜化以及同时进一步提高对磁盘的耐久性产生大的影响的构成润滑层的润滑剂的耐久性，尤其是LUL耐久性和耐氧化铝性（抑制氧化铝导致的润滑剂的分解）等特性。  Thus, it is required to achieve an excellent long-term stability of the lubricating layer, magnetic disk having high reliability at a low floating amount in recent years, accompanied by a high recording density magnetic gap of the magnetic head and reducing conditions, and, due to the use of use the diversification of the environmental resistance required for the disk becomes very strict, as compared with conventional, further thinning the lubricant layer need and further improve the lubricating layer constituting a large effect on the durability of the disk lubricant durability, particularly resistance LUL durability and alumina (aluminum oxide leads to inhibition of decomposition of the lubricant) and other features. 本发明是鉴于这样的现状而完成的，以其作为目标，提供一种能够实现磁间隙的进一步减少，而且磁盘的耐久性尤其是LUL耐久性和耐氧化铝性优异，在伴随着近年急速的高记录密度化的磁头的低上浮量的条件下，并且在伴随用途多样化的非常严格的耐环境性的条件下具有高可靠性的磁盘用润滑剂化合物，使用该润滑剂化合物的磁盘及其制造方法。  The present invention is accomplished in view of such current situation, with its target, which can realize further reduction of the magnetic gap, and magnetic disk LUL durability, particularly excellent durability and alumina, with accompanying in recent years, under conditions of low flying height of rapid high recording density of the magnetic head and the magnetic disk having high reliability in the concomitant use of highly stringent conditions to a variety of environmental resistance lubricant compound, the lubricant compound disk and its manufacturing method. 本发明人就对磁盘的耐久性产生大的影响的润滑剂进行了专心研究，结果发现， 通过以下的发明，可以解决前述问题，从而完成了本发明。  The present invention will have a big impact on the durability of the disk lubricant intensively studied and found that the following inventions can solve the aforementioned problems, and completed the present invention. 即，本发明具有以下构成。  That is, the present invention has the following configuration. -种磁盘用润滑剂化合物，其是一种在基板上至少依次设置了磁性层、保护层以及润滑层的磁盘的前述润滑层中含有的润滑剂化合物，其特征在于，该润滑剂化合物由结构中具有全氟聚醚主链，且在除分子末端以外的位置具有芳香族基，并且在分子的末端具有极性基的化合物构成。  - seed disk with a lubricant compound, which is a sequentially provided on a substrate at least a magnetic layer, a protective layer and a lubricant compound layer of the disk lubricant contained in the lubricating layer, wherein the lubricant compounds having a perfluoropolyether structure in the main chain and having an aromatic group at a position other than the end of the molecule, and a compound having a polar group constituting the molecule at the end. 构成1中所述的磁盘用润滑剂化合物，其特征在于，所述化合物是在前述芳香族基附近还具有极性基的化合物。  The configuration of the disk 1 with a lubricant compound, wherein the compound is in the vicinity of the aromatic compound having polar groups further. 构成1或2中所述的磁盘用润滑剂化合物，其特征在于，所述化合物的一个分子中的极性基的数量为7个以下。  The configuration of the disk lubricant 1 or 2 compound, characterized in that a number of molecules of the compound in the polar group is 7 or less. 构成1 一3任一项中所述的磁盘用润滑剂化合物，其特征在于，前述化合物的所述极性基为羟基。  a magnetic disk according to any one of claim 3 in a lubricant compound, wherein the polar group of the compound is a hydroxyl group. 构成1 一4任一项所述的磁盘用润滑剂化合物，其特征在于，前述化合物的数均分子量在1000 - 10000的范围。  The magnetic disk of any of claims 1 4 with a lubricant compound, wherein the number average molecular weight compound 1000-- range 10,000. 在基板上至少依次设置了磁性层和保护层以及润滑层的磁盘，其特征在于，前述润滑层含有构成1至5任一项所述的磁盘用润滑剂化合物。  provided with at least the disk and the protective layer and the lubricant layer of the magnetic layer on a substrate, wherein the lubricating layer containing a lubricant for a magnetic disk compound of any of claims 1 to 5. 构成6所述的磁盘，其特征在于，所述保护层是通过等离子体CVD法成膜的碳系保护层。  The magnetic disk of claim 6, wherein the protective layer is a carbon-based protective film forming layer by plasma CVD method. 构成7所述的磁盘，其特征在于，所述保护层在与前述润滑层接触侧含有氮。  The magnetic disk of claim 7, wherein said protective layer contains a nitrogen in contact with the lubricating layer side. 构成5 - 8任一项所述的磁盘，其特征在于，其是搭载于启动停止机构为加载卸载方式的磁盘装置中的磁盘。  in a 5 - Disk according to any one 8, characterized in that it is mounted on the stopping mechanism to start the disk loading and unloading apparatus of the embodiment of the disk. 在基板上至少依次设置了磁性层、保护层以及润滑层的磁盘的制造方法，其特征在于，使包含构成1 一5任一项所述的磁盘用润滑剂化合物的润滑剂组合物在前述保护层上成膜而形成前述润滑层。  provided with at least a magnetic layer, a protective layer and a method of manufacturing a magnetic disk lubricant layer on a substrate, wherein the magnetic disk according to any one of claims 1 5 a lubricant composition comprising a lubricant composed of a compound forming the protective layer on the lubricant layer is formed. 构成10所述的磁盘制造方法，其特征在于，在前述润滑层成膜后，对前述磁盘实施紫外线照射，或者实施紫外线照射和加热处理两者。  The method of manufacturing a disk 10 configured according to, wherein, after forming the lubricating layer, ultraviolet irradiation on the disk embodiments or embodiments both ultraviolet irradiation and heat treatment. 构成1涉及的润滑剂化合物，其由结构中具有全氟聚醚主链，且在除分子末端以外的位置具有芳香族基，并且在分子的末端具有极性基的化合物构成。  The lubricant composed of the compound according to 1, which has a perfluoropolyether main chain structure and having an aromatic group at a position other than the end of the molecule, and a compound having a polar group constituting the molecule at the end. 可以认为，这种润滑剂化合物一旦在磁盘的保护层上成膜，润滑剂分子的芳香族基和保护层通过一相互作用（interaction)接近，通过这种相互作用润滑剂吸附到保护层上。 It is believed that once the lubricant on the protective layer compound film-forming disk, an aromatic group and a protective layer lubricant molecules by an interaction (Interaction) close to adsorb onto the protective layer by interaction such lubricant. 也就是说，通过在润滑剂分子的除末端以外的位置上导入芳香族基，尽可能减小润滑剂分子体积的增大，可以使得润滑剂分子以更为扁平的状态稳定地存在于介质上。 That is, by introducing an aromatic group in a position other than the end of the lubricant molecules, as large as possible to reduce the volume of the lubricant molecules, the lubricant can be more flattened condition molecules stably present in the medium . 因此，在涂布到盘面上时，润滑剂分子在芳香族基的位置上与保护层固定在一起，能够形成抑制保护层上的润滑剂分子的体积增大的润滑层，可以形成薄膜的润滑层。 Thus, when applied to the disk, the lubricant molecules at the position on the aromatic group and the protective layers together, it is possible to suppress the volume of lubricant molecules form a protective layer on the lubricant layer is increased, the lubricating film can be formed Floor. 而且，能够形成即使润滑层的膜厚度变薄也可以充分覆盖保护层表面（覆盖率高）的润滑层。 Further, the film thickness can be formed even if the lubricating layer can be thinned sufficiently cover the surface protective layer (high coverage) lubricant layer. 而且，在涂布到盘面上时，润滑剂分子在芳香族基的位置上与保护层固定在一起，润滑剂分子以更扁平的状态稳定地存在于介质上，由此，润滑剂分子间相互作用或极性基相互之间的吸引产生的相互作用被抑制，因此位于润滑剂分子的末端的极性基（例如羟基）有效地参与与保护膜上的活性点的结合，能够提高润滑层的粘着性。 Further, when applied to the disk, the lubricant molecules is fixed at a position on the aromatic group together with the protective layer, a lubricant molecules in a more flat state is stably present in the medium, whereby, between the lubricant molecules with each other or a polar group suction effect produced by the interaction between each other is suppressed, thus residing at the polar end groups of the lubricant molecules (e.g., hydroxyl) effectively involved in binding to the active site of the protective film, a lubricant layer can be improved adhesion. 而且，本发明的润滑剂化合物的分子中具有芳香族基，因此氧化铝等路易斯酸被优先吸引到该分子中的芳香族基上，因此难以引起由于氧化铝导致的全氟聚醚系润滑剂的主链部分的分解，结果获得了能够保证充分的长期可靠性的耐氧化铝性和LUL耐久性。  Further, the lubricant molecules in the compounds of the present invention having an aromatic group, a Lewis acid such as alumina and therefore are preferentially attracted to the aromatic group in the molecule, because it is difficult to cause the resulting perfluoropolyethers alumina decomposition of the main chain portion of the lubricant, the results obtained to ensure sufficient long-term reliability and resistance to alumina LUL durability. 也就是说，通过本发明，能够形成与保护层的粘着性高，薄膜的均匀的涂布膜的润滑层，因此能够实现磁间隙的进一步减少。  That is, by the present invention, the adhesive is capable of forming the protective layer is high, the lubricating coating film layer having a uniform film, it is possible to achieve a further reduction of the magnetic gap. 而且，本发明的润滑剂化合物耐氧化铝性优异， 可获得在伴随着近年来急速的高记录密度化的磁头的低上浮量（5nm或之下）的条件下，以及伴随着用途多样化的非常严格的耐环境性的条件下，具有高可靠性的磁盘。 Moreover, the alumina-resistant lubricant compounds of the present invention is excellent, can be obtained at a low flying height of recent years, along with rapid high-recording density magnetic head (5nm or below) the conditions of use and with diversification of under very strict conditions, environmental resistance, high reliability disk. 此外，如构成2中所述的，前述化合物优选芳香族基附近还具有极性基的化合物。  Further, as in the configuration 2, the vicinity of the compound is preferably an aromatic compound having polar groups further. 通过润滑剂分子中位于芳香族基附近的极性基（例如羟基）和保护层之间发生合适的相互作用，由上述芳香族基造成的润滑剂分子体积的增大被尽量减小，能够进一步提高使润滑剂分子以更扁平的状态稳定存在于介质上的作用。 Lubricant molecules by the polar groups in the aromatic group is located in the vicinity of suitable interaction (e.g. hydroxy) between the protective layer and, due to the increase in the aromatic-based lubricant is to minimize the volume of the molecule can be further improve the lubricant molecules in a more flat state stably present in a medium role. 而且，还有助于润滑层粘着性的提高。 Moreover, also help to improve the adhesion of the lubricating layer. 此外，如构成3所述，前述化合物优选一个分子中的极性基数量在7个以下。  Further, as the configuration 3, the number of the compound is preferably a polar group in the molecule 7 or less. 其原因在于，担心如果一个分子中的极性基数目过多（例如如果一个分子中的极性基数目比7 多），则润滑剂的分子间相互作用或极性基之间的吸引导致的相互作用（分子内相互作用） 过大。 This is because a fear that if the number of polar groups in the molecule is too large (e.g., if the number of polar groups in a ratio of more than seven molecule) results in suction between the rooms, the lubricant molecular interactions or polar group interactions (intramolecular interactions) are too large. 而且，过剩的极性基存在容易产生污染物等的吸引或润滑剂向磁头转移的倾向。 Moreover, excess polar group tends to easily generate or attract contaminants such as transfer of the lubricant to the magnetic head. 此外，如构成4所示，前述化合物具有的极性基特别优选是羟基。  Further, as shown in configuration 4, the aforementioned compound having a polar group is particularly preferably a hydroxyl group. 之所以优选羟基，是因为羟基与保护层，尤其是碳系保护层的相互作用大，提高了润滑层和保护层的附着性。 The reason why a hydroxy group, because the hydroxyl group with a protective layer, in particular the interaction of a carbon-based protective layer is large, to improve the adhesion of the lubricating layer and the protective layer. 此外，如构成5所示，前述化合物的数均分子量特别优选1000 - 10000的范围。  Further, as shown in Figure 5 configuration, the number average molecular weight of the compound particularly preferably 1000 - Scope 10,000. 这是因为，由于适度的粘度而具备修复性，发挥合适的润滑性能，而且能够兼备优异的耐热性。 This is because, since appropriate viscosity and includes reparative play suitable lubricating properties, but also excellent in both heat resistance. 此外，如构成6所示，具有含本发明涉及的润滑剂化合物的润滑层的磁盘能够实现磁间隙的进一步减少，而且磁盘的耐久性尤其是LUL耐久性和耐氧化铝性优异，在伴随着近年来的急速的高记录密度化的磁头的低上浮量的条件下，以及伴随用途多样化的非常严格的耐环境性的条件下具有高可靠性。  Further, as shown in Figure 6 configuration, the disk having a lubricant-containing compounds of the present invention relates to a lubricating layer can further reduce the magnetic gap, and magnetic disk LUL durability, particularly excellent in durability and alumina, in recent years, along with rapid low flying height of a high recording density magnetic head conditions, and the concomitant use of highly stringent conditions to a variety of environmental resistance with high reliability. 此外，如构成7所示，前述保护层特别优选是通过等离子体CVD法成膜的碳系保护层。  Further, as shown in FIG 7 constitute, in particular, the protective layer is preferably a carbon-based protective layer is formed by the plasma CVD method. 这是因为，如果通过等离子体CVD法，可以形成表面均匀紧密成膜的碳系保护层，对于本发明是合适的。 This is because, if by plasma CVD, the film formation can be formed uniformly and intimately bringing the surface of the carbon-based protective layer, it is suitable for the present invention. 而且，如构成8所示，由于前述保护层在与前述润滑层接触侧含有氮，可以进一步提高与润滑层的粘着性，因而优选。 Further, as shown in 8 configuration, since the protective layer is in contact with the nitrogen-containing lubricating layer side, the adhesion can be further improved with the lubricant layer, is preferable. 此外，如构成9所示，本发明的磁盘，尤其是作为搭载于LUL方式的磁盘装置中的磁盘是合适的。  Further, as shown in Figure 9 configuration, the disk of the present invention, in particular as a disk device mounted on the disk LUL embodiment is suitable. 通过伴随LUL方式的引入磁头上浮量的进一步降低，可以要求即使在5nm 以下的超低上浮量，磁盘也稳定地动作，因此在低上浮量的条件下具有高可靠性的本发明的磁盘是合适的。 By further lowering the flying height of the magnetic head is introduced Bansui LUL mode may be required even in ultra-low flying height of 5nm or less, the operation of the disk stably, thus having high reliability of the magnetic disk of the present invention under conditions suitable low flying height of the of. 此外，如构成10所示，可以实现磁间隙的减少，而且在低上浮量的条件下具有高可靠性的本发明的磁盘，通过在基板上至少依次设置磁性层、保护层以及润滑层的磁盘的制造方法而获得，该制造方法是通过使含有本发明涉及的磁盘用润滑剂化合物的润滑剂组合物在前述保护层上成膜形成前述润滑层。  Further, as shown in configuration 10, may be implemented to reduce the magnetic gap, and a disk with high reliability according to the present invention at a low floating amount by at least the magnetic layer, and a lubricating protective layer on the substrate the method of manufacturing a magnetic disk and a layer obtained by the manufacturing method of the present invention relates to a disk containing the lubricant the lubricant composition forming the lubricating film forming compound layer on the protective layer. 此外，如构成11所示，在构成10的磁盘的制造方法中，在前述润滑层成膜后，对磁盘实施紫外线照射，或者通过实施紫外线照射和加热处理两者，可以进一步提高成膜的润滑层对保护层的粘着力。  Further, as shown configuration, in the manufacturing method of the magnetic disk 10, after forming the lubricant layer on the disk 11 embodiments ultraviolet irradiation, or by both ultraviolet irradiation and heat treatment embodiment can be further improved to lubricating layer adhesion to the protective film layer. 根据本发明，可以提供能够实现磁间隙的进一步减少，而且磁盘的耐久性尤其是LUL耐久性和耐氧化铝性优异，在伴随着近年来急速的高记录密度化的磁头的低上浮量的条件下，以及在伴随着用途的多样化的非常严格的耐环境性的条件下具有高可靠性的磁盘用润滑剂化合物，使用该润滑剂化合物的磁盘及其制造方法。  According to the present invention, may provide a further reduction of the magnetic gap can be realized, and the disk LUL durability, particularly excellent durability and alumina, in recent years, along with rapid high recording density low floating magnetic head under the conditions of an amount, and a high reliability disk along with very strict environmental resistance under the conditions of use of diverse lubricant compound, and a manufacturing method of the disk lubricant compound. 图1 :是表示比较例中涉及的润滑剂的耐氧化铝性评价结果的图。  FIG. 1: is a graph showing the evaluation results of the comparison lubricant resistant alumina embodiment involved. 图2 :是表示本发明的润滑剂的耐氧化铝性评价结果的图。  FIG 2: is a diagram showing the evaluation results of the lubricant of the present invention, the resistance of alumina. 以下，通过实施方式详细说明本发明。  Hereinafter, the present invention will be described in detail. 本发明涉及的磁盘用润滑剂化合物是在基板上至少依次设置磁性层、保护层以及润滑层的磁盘的前述润滑层中含有的润滑剂化合物，其特征在于，该润滑剂化合物由结构中具有全氟聚醚主链，且在除分子末端以外的位置具有芳香族基，并且在分子的末端具有极性基的化合物构成。  The present invention relates to a magnetic disk with a lubricant compound are sequentially disposed on a substrate at least a magnetic layer, a protective layer and a lubricant compound layer of the disk lubricant contained in the lubricating layer, wherein the lubricant is a compound represented by the structure having a perfluoropolyether main chain and having an aromatic group at a position other than the end of the molecule, and a compound having a polar group constituting the molecule at the end. [0061 ] 作为此处的芳香族基，可以列举例如苯基作为最优选的代表例，此外还可以列举亚萘基、亚联苯基、邻苯二甲酰亚胺基、苯胺基等。  The aromatic group herein may include, for example, preferably a phenyl group as the most representative example, in addition may further include a naphthylene group, biphenylene group, phthalimide group, anilino and the like. 此外，芳香族基不限于1个分子中1个， 可以有多个（例如2个）。 Further, not limited to an aromatic group in a molecule, there may be a plurality (e.g. two). 而且，芳香族基可以有适当的取代基。 Further, the aromatic group may have a suitable substituent group. 这样，本发明涉及的润滑剂化合物是既在结构中具有全氟聚醚主链的链状分子的除末端以外的位置，例如在分子的基本中心处具有例如苯基等芳香族基，又在分子的两末端具有极性基的化合物，但为了更好地发挥本发明的作用效果，优选分子中的芳香族基附近还具有极性基的化合物。  Thus, the present invention relates to a compound of the lubricant is both a position other than the end of the molecular chain of the perfluoropolyether structure in the backbone, e.g., aromatic groups such as phenyl having a basic center in the molecule compound, and having a polar group at both ends of the molecule, but in order to exert a better effect of the present invention, preferably near the molecule further aromatic group compound having a polar group. 例如，特别优选在分子中的芳香族基的两侧分别具有极性基的化合物。 For example, particularly preferred compounds have a polar group in the molecule, both an aromatic group. 此外，本发明涉及的润滑剂化合物中，为了适度抑制由润滑剂的分子间相互作用或极性基之间的互相吸引产生的相互作用（分子内相互作用），并抑制污染物等的吸引或润滑剂向磁头的转移，1分子中的极性基的数目优选在7个以下。  Further, the present invention relates to a compound of the lubricant, in order to moderate inhibition of the interaction (intramolecular interactions) by the intermolecular interaction between the lubricant or polar group generated attract each other, and inhibits contaminants or transfer of lubricant to the suction head, a polar group in the molecule is preferably the number 7 or less. 此外，作为此时的极性基，需要是在保护层上润滑剂成膜时，润滑剂与保护层之间发生合适的相互作用的这种极性基，例如可以列举羟基（-0H)、氨基（-NH2)、羧基（-C00H)、 醛基（-C0H)、羰基（-CO-)、磺酸基（-SO3H)等。  Further, in this case as a polar group, the lubricant film formation is required, such a suitable interaction between the polar group and the protective layer of lubricant on the protective layer, for example, include a hydroxyl group (- 0H), amino (-NH2), carboxyl (-C00H), aldehyde (-C0H), carbonyl (-CO-), a sulfonic acid group (-SO3H) and the like. 尤其是作为极性基，特别优选是羟基。 In particular as a polar group, particularly preferably a hydroxyl group. 这是因为羟基与保护层尤其是碳系保护层的相互作用大，可以进一步提高润滑层与保护层的粘附性。 This is because the hydroxy group and the protective layer, especially the interaction of a carbon-based protective layer is large, can be further improved adhesion of the lubricating layer and the protective layer. 可以认为，如果按照以上的本发明涉及的磁盘用润滑剂化合物，润滑剂分子的芳香族基与保护层通过nn相互作用（interaction)接近，通过这种相互作用润滑剂吸附到保护层上。  It is believed that if the disk according to the above present invention relates to an aromatic group of the lubricant and the protective layer compound, lubricant molecules by interaction nn (Interaction) close to the protective layer by adsorption of a lubricant such interactions on. 也就是说，通过在除润滑剂分子的末端以外的位置上导入芳香族基，尽可能减小润滑剂分子体积的增大，可以使得润滑剂分子以更为扁平的状态稳定地存在于介质上。 That is, by introducing an aromatic group at a position other than the end of the lubricant molecules, the molecules to minimize the increase in volume of lubricant, the lubricant can be more flattened condition molecules stably present in the medium . 因此，在涂布到盘面上时，润滑剂分子在芳香族基的位置上与保护层固定在一起，能够形成抑制保护层上的润滑剂分子体积增大的润滑层，可以形成薄膜的润滑层。 Thus, when applied to the disk, the lubricant molecules at the position on the aromatic group and the protective layer are secured together, the volume of lubricant molecules suppressed can be formed on the protective layer, a lubricating layer increased, the thin film lubricant layer may be formed . 而且，可以形成即使润滑层的膜厚度变薄也可以充分覆盖保护层表面（覆盖率高）的润滑层。 Further, the film thickness can be formed even if the lubricating layer can be thinned sufficiently cover the surface protective layer (high coverage) lubricant layer. 而且，由于润滑剂分子间相互作用或极性基之间的相互吸引产生的相互作用被抑制，因此位于润滑剂分子的末端的极性基（例如羟基）有效地参与与保护膜上的活性点结合，能够提尚润滑层的粘着性。  Further, since the mutual attraction generated between the interactions are inhibited interaction between the lubricant molecules or polar groups, thus residing at the polar end groups of the lubricant molecules (e.g., hydroxyl) and the protective film effective participation the active site binding, yet capable of providing the lubricating layer adhesion. 以下，尽管列举了本发明涉及的润滑剂化合物的例示化合物，但本发明不限于这些化合物。  Here, although the examples of the lubricant include compounds of the compounds of the present invention is shown, but the present invention is not limited to these compounds. 再有，以下的例示化合物No.I-No. 3和No. 5是芳香族基为苯基时的例示，No. 4 是芳香族基为亚萘基时的例示。 Further, the following exemplified Compound No.I-No. 3 and No. 5 is a diagram illustrating when the aromatic group is phenyl, No. 4 is a diagram of an aromatic group at naphthylene embodiment. 另外，No. 5是1分子中有2个芳香族基（苯基）时的例示。 Further, No. 5, there is illustrated in one molecule at two aromatic groups (phenyl). 此外，例示化合物No.I-No. 5中的羟基数分别是4、6、4、2和6个。 Further, exemplified compound No.I-No. 5, a hydroxyl number 4,6,4,2 and 6, respectively. 并且，上述例示的表示本发明的润滑剂化合物的化学式中，m、n分别表示1以上的整数。  Further, the above-exemplified compounds represented by the chemical formula of the lubricant of the present invention, m, n each represents an integer of 1 or more. 本发明的润滑剂化合物可以通过例如以下这种合成法获得。 Lubricant compound  The following example of the present invention may be obtained by such a synthesis. 以下表示上述例示No. 1的润滑剂化合物的合成图表的一个例子。  The following chart shows an example of a synthetic lubricant compound 1 shown above in Example No..
 作为本发明涉及的润滑剂化合物的制造方法，可以优选列举如上述合成图所示， 对于分子中具有全氟聚醚主链的全氟聚醚化合物，在碱性条件下，通过与例如使具有环氧基和芳香族基的化合物（例如间苯二酚二缩水甘油醚）反应进行的制造方法。  As a method for producing the compounds of the present invention relates to a lubricant can be preferably exemplified above as shown in FIG synthesized, the perfluoropolyether compound to the perfluoro polyether backbone molecule, under basic conditions, by for example, a compound having an epoxy group and an aromatic group (e.g., resorcinol diglycidyl ether) a method for producing a reaction. 此外，对于上述例示的No. 2的润滑剂化合物，也可以按照上述合成图，对于分子中具有全氟聚醚主链的全氟聚醚化合物，在碱性条件下，通过与例如具有环氧基和芳香族基的下述化合物反应来获得。  In addition, for the embodiment shown the lubricant No. Compound 2, may be synthesized according to the above diagram, the molecular perfluoropolyether compound having a perfluoropolyether backbone, under basic conditions, for example by the following compound having an epoxy group and an aromatic group is obtained. 此外，对于上述例示的No. 3的润滑剂化合物，可以通过将上述例示的No. 1的润滑剂化合物的合成中使用的例如间苯二酚二缩水甘油醚替换成其对位体（对苯二酚二缩水甘油醚），按与例示No. 1的润滑剂化合物同样方式获得。  Further, the lubricant for the compound No. 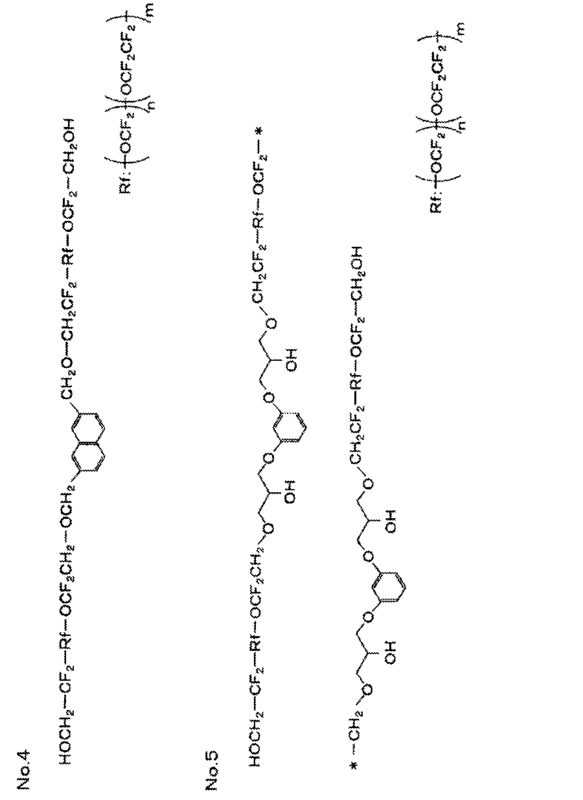 3 illustrated above, can be prepared by, for example, resorcinol diglycidyl ether replaced by its synthetic lubricants ligand compounds exemplified above No. 1 used in (hydroquinone diglycidyl ether), is obtained in the same manner as a lubricant and the compound No. 1 is illustrated. 此外，对于上述例示的No.4的润滑剂化合物，可以通过使用2, 7-二（溴甲基）萘来代替上述例示的No. 1的润滑剂化合物的合成中使用的例如间苯二酚二缩水甘油醚，按与例示No. 1的润滑剂化合物同样方式获得。 Synthetic lubricants such as m of the compound No. 1  In addition, the lubricant of the No.4 compound exemplified above, may be replaced by use of the above-exemplified 2, 7-di (bromomethyl) naphthalene used hydroquinone diglycidyl ether, obtained according to Example No. 1 shown in the same manner as a lubricant compound. 此外，对于上述例示的No. 5的润滑剂化合物，除了例如使3当量全氟聚醚化合物与间苯二酚二缩水甘油醚进行反应之外，可以按与例示No. 1的润滑剂化合物同样方式获得。  In addition, for the embodiment shown the lubricant No. Compound 5, except for example 3 equivalents of the perfluoropolyether reacted with a compound other than resorcinol diglycidyl ether, and may be exemplified by lubricating the No. 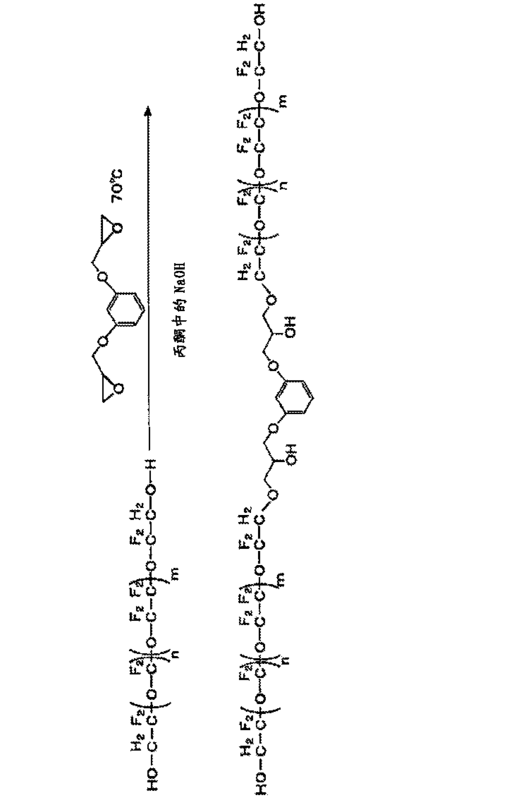 1 compound obtained in the same manner. 本发明涉及的润滑剂化合物的分子量没有特别限制，但例如数均分子量（Mn)优选在1000-10000的范围内，更优选在1000-6000的范围内。 Molecular weight  The present invention relates to a compound of the lubricant is not particularly limited, but for example, the number average molecular weight (Mn) is preferably in the range of 1,000 to 10,000, more preferably in the range of 1000 to 6000. 这是因为，由于适度的粘度而具备修复性，发挥了合适的润滑性能，而且能够兼备优异的耐热性。 This is because, since appropriate viscosity and includes reparative played a suitable lubricating properties, but also excellent in both heat resistance. 此外，本发明涉及的润滑剂化合物如果例如按照上述的制造方法，可获得高分子量的化合物，可以抑制由于热分解导致的低分子化，因此使用这种润滑剂形成磁盘时，可以提高其耐热性。 When  Further, the present invention relates to a compound of the lubricant, if according to the above manufacturing method, a high molecular weight compound can be obtained, for example, can be suppressed in molecular weight due to thermal decomposition of lead, the use of such lubricants into a disc can be improved its heat resistance. 由于随着近年的高记录密度化磁头的上浮量进一步降低（5nm以下），磁头和磁盘表面的接触、摩擦频发的可能性变高。 Because as the floating amount of the high recording density magnetic head is further decreased in recent years (5nm or less), the contact surface of the head and the disk, the possibility of frequent friction becomes high. 此外，磁头接触时，有时存在不立刻从磁盘表面离开而摩擦滑动片刻的情况。 Further, when the head contacts, sometimes present immediately without sliding friction moment away from the disk surface. 此外，由于近年来的磁盘的高速旋转进行的记录再生，发生比以往更多的由于接触或摩擦导致的发热。 Further, since the recording in recent years, high-speed rotation of the magnetic disk for reproduction, more conventional than the contact or due to heat generation caused by friction occurs. 因此，担心由于这种热的发生，磁盘表面的润滑层材料发生热分解的可能性比以往更高，这种被热分解而低分子化的流动性增高的润滑剂附着在磁头上，可能给数据的读取、写入带来障碍。 Thus, due to this heat generating fear, the possibility of thermal decomposition higher than conventionally, the lubricating layer material is thermally decomposed disk surface of the occurrence of a low molecular mobility increased lubricant adhering on the head, can give read data written to bring obstacles. 此外，考虑到不久的将来在磁头和磁盘接触的状态下数据的记录再生，经常接触导致的发热的影响更令人担忧。 In addition, taking into account the near future to record the state of the head and disk contact data regeneration, regular contact with the heating effect caused even more worrying. 考虑到这种状况， 希望润滑层所需要的耐热性更高，因此本发明的润滑剂是合适的。 In consideration of this situation, it is desirable lubricating layer having higher heat resistance needed, the lubricant of the present invention is thus suitable. 通过上述合成方法获得本发明的润滑剂时，按照适当的分子量分级，例如使数均分子量（Mn)在1000-10000的范围内是合适的。  When the lubricant of the present invention obtained by the above synthesis method, according to the appropriate molecular weight fractionation such that the number average molecular weight (Mn) in the range of 1,000 to 10,000 is suitable. 此时对分子量分级的方法没有特别限制， 例如可以使用通过凝胶渗透色谱法（GPC)法进行的分子量分级，通过超临界提取法进行的分子量分级等。 At this time, the molecular weight is not particularly limited fractionated, for example by using gel permeation chromatography (GPC) method of molecular weight fractionation, molecular weight fractionation is carried out by supercritical extraction method. 此外，本发明还提供一种磁盘，其是在基板上至少依次设置了磁性层、保护层以及润滑层的磁盘，其特征在于前述润滑层含有本发明的润滑剂化合物。  Further, the present invention provides a magnetic disk, which are sequentially disposed on a substrate at least a magnetic layer, a protective layer and a lubricating layer disk, wherein the lubricant layer contains a lubricant compound of the invention. 使用本发明的润滑剂化合物形成润滑层时，可以使用使上述润滑剂化合物分散溶解于氟系溶剂等中的溶液，例如通过浸涂法涂布来成膜。  When forming a lubricating layer of a lubricant compound of the invention, the compound may be used so that the lubricant is dissolved in the solution dispersing a fluorine-based solvent or the like, for example, a coating deposited by dip coating method. 另外，润滑层的形成方法当然不限于上述浸涂法，还可以使用旋涂法、喷涂法、纸涂法（\ -A- 3 -卜法）等成膜方法。  Further, the method of forming the lubricant layer is of course not limited to the dip coating method, may be used spin coating, spray coating, paper coating - deposition method (\ -A- 3 BU method). 本发明中，为了进一步提高成膜的润滑剂对保护层的附着力，成膜后将磁盘暴露于例如50°C-150°C的气氛下实施加热处理，或者可以对磁盘实施紫外线（UV)照射。  The present invention, in order to further improve the adhesion of the lubricant forming the protective layer, after deposition, for example, the disk is exposed to a heat treatment under an atmosphere of 50 ° C-150 ° C, or may be implemented ultraviolet disk (UV) irradiation. 也就是说，作为后处理，可以进行烘焙处理和UV处理这两种处理，但本发明中，作为后处理，为了进一步加强润滑剂分子中的芳香族基和该芳香族基周边对保护层的化学结合，优选至少进行合适的UV处理，更优选的是并用烘焙处理和UV处理这两种处理。 That is, as a post-treatment, baking treatment may be performed both processing and UV processing, but the present invention, as a post-treatment, in order to further strengthen the lubricant molecules in the aromatic group and an aromatic group on the periphery of the protective layer chemical bonding, preferably at least suitable UV treatment, and more preferably both processing and baking treatment and UV treatment. 以往的润滑层的膜厚度通常在15- 18A左右，本发明中，可以比以往更薄膜化，例如可以形成1:0-1¾!左右的薄膜。  the film thickness of a conventional lubricating layer is usually about 15- 18A, in the present invention, a thin film may be more than ever, for example, may be formed 1:! 0-1¾ about films. 另外，若不满i〇_A,有时存在对保护层的覆盖率不充分的情况。 In addition, if dissatisfied i〇_A, sometimes there is coverage of the protective layer is insufficient. 此外，作为本发明的保护层，可以优选使用碳系保护层。  Further, as the protective layer of the present invention can be preferably used a carbon-based protective layer. 尤为优选无定形的碳系保护层。 Amorphous carbon-based protective layer is especially preferred. 通过保护层特别是碳系保护层，本发明涉及的润滑剂的极性基（例如羟基）和保护层的相互作用进一步增强，且本发明的作用效果得到进一步发挥，因而是优选方式。 In particular through the protective layer is a carbon-based protective layer, a lubricant present invention relates to a polar group (e.g., hydroxyl) and a protective layer interaction is further enhanced, and the effect of the present invention is further play, which is a preferred embodiment. 本发明中的碳系保护层中，合适的是，例如形成保护层的润滑层侧中含有氮，磁性层侧中含有氢的组成倾斜层。  The carbon-based protective layer in the present invention, suitable are, for example, a composition gradient layer of nitrogen, hydrogen contained in the magnetic layer side of the lubricant layer contains the protective layer side. 作为使保护层的润滑层侧中含有氮的方法，可以列举通过用氮等离子体处理保护层成膜后的表面，打入氮离子的方法，或形成氮化碳膜的方法等。 As the protective layer, a lubricating layer containing nitrogen side method can be exemplified by a nitrogen plasma treatment of the surface of the rear protective layer was formed, nitrogen ions into a method of forming a carbon nitride film, or the like method. 通过这种方式，可以进一步提高润滑剂对于保护层的粘着性，因此可以获得更薄的膜厚且覆盖率好的润滑层，从而可以更有效地获得本发明的效果。 In this manner, the lubricant can be further improved adhesion of the protective layer, it is possible to obtain a thinner film thickness and good coverage of the lubricating layer, which can more effectively obtain the effects of the present invention. 本发明中使用碳系保护层时，可以通过例如DC磁控溅射法成膜，但特别优选为通过等离子体CVD法成膜的无定形的碳保护膜。  When using the present invention, the carbon-based protective layer, forming, for example, by DC magnetron sputtering method, but particularly preferably by amorphous carbon protective film formed by a plasma CVD method. 通过等离子体CVD法成膜，保护层表面均匀紧密地成膜。 By forming a plasma CVD method, the surface protective layer is formed by uniformly and intimately. 因此，更优选在粗糙度小、并通过CVD法成膜的保护层上形成本发明的润滑层。 Thus, more preferably in roughness, and forming a lubricating layer of the present invention, the protective layer is formed by a CVD method. 本发明中，保护层的膜厚度可以为20-70A。  In the present invention, the film thickness of the protective layer may 20-70A. 不到20A时，有时存在作为保护层的性能降低的情况。 When less than 20A, there is sometimes a case where the performance of the protective layer is lowered. 此外，如果超过70人，从薄膜化的观点出发不优选。 Further, if it exceeds 70, the film is not preferred from the viewpoint of making. 本发明的磁盘中，优选基板是玻璃基板。  The magnetic disk according to the present invention, preferably the substrate is a glass substrate. 玻璃基板有刚性，平滑性优异，因此对于高记录密度化是合适的。 Rigid glass substrate, is excellent in smoothness, so for a high recording density is suitable. 作为玻璃基板，可以列举例如铝硅酸盐玻璃基板，尤其合适的是化学增强的铝硅酸盐玻璃基板。 A glass substrate, for example, can include an aluminosilicate glass substrate, particularly suitable are chemically reinforced aluminosilicate glass substrate. 本发明中，上述基板的主表面的粗糙度，优选Rmax在3nm以下，优选Ra在0. 3nm 以下的超平滑。  In the present invention, the roughness of the main surface of the substrate, preferably 3nm or less in Rmax, Ra preferably of 0. The smoothed over 3nm or less. 而且，此处所谓的表面粗糙度Rmax、Ra是基于JISB0601的规定制定的。 Moreover, here the so-called surface roughness Rmax, Ra was developed based on the provisions of JISB0601. 根据本发明获得的磁盘在基板上至少具备磁性层、保护层以及润滑层，但在本发明中，上述磁性层没有特别限制，可以是面内记录方式用磁性层，也可以是垂直记录方式用磁性层，特别是垂直记录方式用磁性层适于近年的急速的高记录密度化的实现。  The magnetic disk of the present invention is obtained on the substrate includes at least a magnetic layer, a protective layer and a lubricating layer in the present invention, the magnetic layer is not particularly limited, and may be the inner surface of the recording magnetic layer, or may be vertically a magnetic recording layer, especially perpendicular recording method suitable for the rapid in recent years to achieve high recording density of the magnetic layer. 尤其是，如果是CoPt系磁性层，可以获得高矫顽力和高再生输出，因此优选。 In particular, if a CoPt-based magnetic layer, a high coercive force and a high reproduction output, and therefore preferable. 本发明的磁盘所优选的垂直磁记录盘中，在基板和磁性层之间，可以根据需要设置基底层。  Preferred disks perpendicular magnetic recording disk of the present invention, between the substrate and the magnetic layer, the base layer may be provided according to need. 而且，还可以在该基底层和基板之间设置附着层或软磁性层等。 Further, the adhesive layer may be provided soft magnetic layer or the like between the base layer and the substrate. 此时，作为基底层，可以列举例如Cr层、Ta层、Ru层、或CrMo、CoW、CrW、CrV、CrTi合金层等，作为上述附着层，可以列举例如CrTi、NiAl、AlRu合金层等。 In this case, as the base layer, may include a Cr layer, Ta layer, Ru layer, or CrMo, CoW, CrW, CrV, CrTi alloy layer or the like, as the adhesive layer include, for example CrTi, NiAl, AlRu alloy layer or the like. 此外，作为上述软磁性层，可以列举例如CoZrTa合金膜等。 Further, as the soft magnetic layer may include CoZrTa alloy film. 作为适于高记录密度化的垂直磁记录盘，合适的构成是在基板上具备附着层、软磁性层、基底层、磁性层（垂直磁记录层）、碳系保护层、润滑层。  As a perpendicular magnetic recording disk is suitable for high recording density, a suitable configuration includes a bonding layer, a soft magnetic layer, underlayer, magnetic layer (perpendicular magnetic recording layer), a carbon-based protective layer, lubricating layer on a substrate . 此时，在上述垂直磁记录层上，间隔交换结合控制层，设置辅助记录层也是合适的。 At this time, on the perpendicular magnetic recording layer, exchange coupling control layer spacing, the auxiliary recording layer are also suitable. 根据本发明，由于能够形成与保护层的粘着性高、为薄层膜的且均匀的涂布膜的润滑层，因此可以实现磁间隙的进一步减少。  According to the present invention, it is possible to form a protective layer with high adhesion, and uniform lubricating layer is a coating film of the thin film, it is possible to achieve a further reduction of the magnetic gap. 而且，可获得了磁盘的耐久性，尤其是LUL耐久性和耐氧化铝性优异，在伴随着近年来的急速的高记录密度化的磁头的低上浮量（5nm 或其以下）的条件下，以及伴随用途多样化的非常严格的耐环境性的条件下具有高可靠性的磁盘。 Further, the durability can be obtained the disk, especially alumina LUL durability and excellent in low flying height of the accompanying recent rapid high-recording density magnetic head (5nm or less) condition, high reliability of the disk and the accompanying diversification purposes under very strict conditions of environmental resistance. 也就是说，本发明的磁盘，尤其是作为搭载于LUL方式的磁盘装置中的磁盘是合适的。  That is, the disk of the present invention, in particular as a magnetic disk device is mounted on the disk LUL embodiment is suitable. 由于伴随着LUL方式的引入，磁头的上浮量进一步下降，因此可以实现即使在例如5nm以下的极低的上浮量，磁盘也稳定动作的要求，在低上浮量的条件下具有高可靠性的本发明的磁盘是合适的。 Since the introduction of accompanying LUL embodiment, the amount of floating of the magnetic head is further decreased, the requirements can be achieved even in a low flying height of 5nm or less, but also stable operation of the disk, with the present high reliability at a low floating amount of disk invention is suitable. 以下，通过实施例对本发明进行更具体的说明。  Hereinafter, a more specific embodiment of the present invention by the embodiment. 本实施例的磁盘，在基板上依次形成附着层、软磁性层、第1基底层、第2基底层、 磁性层、碳系保护层和润滑层。  The present embodiment of the disk, are sequentially formed on a substrate adhesion layer, a soft magnetic layer, a first base layer, second base layer, a magnetic layer, a carbon-based protective layer and a lubricating layer. 按照前述合成图如以下方式制造前述的例示No. 1的润滑剂化合物。  Synthesis according to the embodiment of FIG. As the above-described embodiment shown for producing compound No. 1 of the lubricant. 通过在碱性条件下（NaOH)，使间苯二酚二缩水甘油醚与分子中具有全氟聚醚主链且在两末端具有羟基的全氟聚醚化合物（参照前述合成图）反应来制造。  under basic conditions by (NaOH), and resorcinol diglycidyl ether having in the molecule and a perfluoro polyether backbone a perfluoropolyether compound having hydroxyl groups at both ends (with reference to the FIG Synthesis) reaction. 由如上述方式得到的化合物构成的润滑剂通过超临界提取法进行适当的分子量分级。  The lubricant composed of the above compound obtained by molecular weight fractionation appropriate supercritical extraction. 准备化学增强的铝硅酸盐玻璃构成的2. 5英寸型玻璃盘（外径65mm，内径20mm， 盘厚0• 635mm)，制成盘基板。  2.5 inches glass plate (outer diameter 65mm, inner diameter of 20mm, a thickness of the disc 0 • 635mm), to prepare the disc substrate made of chemically reinforced aluminosilicate glass. 盘基板1的主表面，镜面研磨成Rmax为2. 13nm，Ra为0• 20nm。 The main surface of the disc substrate 1 is mirror-polished to Rmax 2. 13nm, Ra is 0 • 20nm. 在该盘基板上，通过DC磁控溅射法，在Ar气气氛中，依次成膜Ti系附着层、Fe系的软磁性层、Ru的第1基底层、相同Ru的第2基底层、CoCrPt磁性层。 2  on the disc substrate by DC magnetron sputtering in an Ar gas atmosphere, successively forming a Ti-based adhesive layer, the Fe-based soft magnetic layer, a first base layer of Ru, a Ru same base layer, CoCrPt magnetic layer. 该磁性层是垂直磁记录方式用磁性层。 The magnetic layer is a magnetic layer with perpendicular magnetic recording. 接着，通过等离子体CVD法，以膜厚5〇盖成膜类金刚石碳系保护层。  Next, by plasma CVD, to a thickness of diamond-like carbon film forming the cover 5〇-based protective layer. 下面，如下述方式形成润滑层。  Next, a lubricant layer is formed as follows. 制备使润滑剂（使用NMR法测定的Mn为2800,分子量分散度为L10)以0• 2重量％的浓度分散溶解在作为氟系溶剂的三井r >7口口力；P社制造的只一卜b 少XF(商品名）中的溶液，该润滑剂由按上述方式制造且通过超临界提取法进行了分子量分级的本发明的润滑剂（前述例示化合物No. 1)构成。  Preparation of lubricant (Mn measured by using the NMR method was 2,800, a molecular weight dispersion L10) at a concentration of 0 • 2% by weight of dispersed and dissolved in a fluorine-based solvent Mitsui r> 7 mouth force; manufactured P b Bu only a few XF (trade name) was the lubricant from the lubricant manufacturer manner described above and the molecular weight was fractionated by supercritical extraction method of the present invention (the exemplified compound No. 1) configuration. 将该溶液作为涂布液，浸渍成膜至保护层的磁盘，通过浸涂法涂布，使润滑层成膜。 The solution as a coating liquid to the impregnated disks forming the protective layer by dip coating method, a lubricating layer was formed. 成膜后，在真空焙烧炉内以130°C，90分钟将磁盘加热处理。  After the film formation, to 130 ° C, 90 min heat treatment in a vacuum disk roaster. 用傅立叶变换型红外分光光度计（FTIR)测定润滑层的膜厚，得出膜厚为12鬼。 Lubricant layer film thickness measurement with a Fourier transform infrared spectrophotometer (FTIR), a thickness of 12 obtained ghost. 润滑层覆盖率在80%以上为良好。 Lubricating layer coverage of 80% or more as well. 这样，得到了实施例1的磁盘。 In this way, the magnetic disk 1 of the embodiment. 接着，用以下的试验方法，进行实施例1的润滑剂和磁盘的评价。  Next, the following test methods were evaluated and disk lubricant of Example 1. (1)首先，进行实施例1中使用的上述润滑剂的耐氧化铝性评价试验。  (1) First, an alumina resistance evaluation test of the lubricant used in Example 1 embodiment. 通过使上述润滑剂中存在20%氧化铝（Al2O3)，在氮气（N2)气氛下，250°C的恒温下，使之保持500分钟，进行热重量分析。  By the presence of 20% alumina (Al2O3) of the lubricant, under nitrogen (N2) atmosphere, to 250 ° C at a constant temperature, so that for 500 minutes, and thermal gravimetric analysis. 其结果示于图2。  The results are shown in FIG. 实施例1中使用的本发明涉及的润滑剂在添加氧化铝时的衰减率（以图中的点划线表示的曲线）为约30%以下，显示了优异的耐氧化铝性，即难以发生氧化铝导致的分解。 The lubricant used in the present invention according to Example 1 embodiment the attenuation rate (curve A dotted chain line) when adding the alumina is about 30% or less, exhibits excellent resistance to alumina, that is likely to occur due to the decomposition of alumina. 此外，还显示了不添加氧化铝时的衰减率为约10%以下，耐热性优异。 In addition, the attenuation rate is also displayed when no alumina was added to about 10% or less, excellent in heat resistance. (2)接着，为了评价磁盘的LUL(加载卸载）耐久性，进行LUL耐久性试验。  (2) Next, in order to evaluate LUL disk (loading and unloading) durability, LUL durability test was performed. 准备LUL方式的HDD(5400rpm旋转型），搭载上浮量为5nm的磁头和实施例的磁盘。  Preparation LUL embodiment HDD (5400rpm rotation type), the amount of 5nm floating mounting of the head and the disk embodiment. 磁头的滑块是NPAB(负压）滑块，再生元件搭载磁阻效应型元件（GMR元件）。 NPAB head slider is (negative pressure) of the slider, regeneration type magnetoresistive element mounting element (GMR element). 屏蔽部为FeNi系坡莫合金。 The shield portion is a FeNi-based permalloy. 使该LUL方式HDD重复连续LUL动作，测量直到故障发生时的磁盘耐久的LUL次数。 The HDD embodiment LUL LUL operations were continuously repeated, until the disk when the measured failure times LUL durable. 其结果是，实施例1的磁盘在5nm的超低上浮量下耐久至无障碍90万次的LUL动作。  As a result, the disk of Example 1 to Roll durability of 900,000 LUL action of ultra-low flying height of 5nm. 通常的HDD的使用环境下可以说LUL次数超过40万次，需要使用大约10年左右，现状是如果耐久60万次以上就是合适的，因此可以说实施例1的磁盘具有极高的可靠性。 Under normal HDD using environment can be said to number more than 400,000 LUL times, the need to use about 10 years, if the status quo is durable for more than 60 million times is appropriate, it can be said disk of Example 1 has a very high reliability. 用光学显微镜和电子显微镜详细观察LUL耐久性试验后的磁盘表面，但没有观察到损伤或污渍等异常，状态良好。  observed in detail after the disk surface LUL durability test by an optical microscope and an electron microscope, were observed but no damage such as stains or abnormal, in good condition. 此外，用光学显微镜和电子显微镜详细观察LUL耐久性试验后的磁头表面，但没有观察到损伤或污渍等异常，而且，也没观察到润滑剂向磁头的附着，或腐蚀损害，状态良好。 Further, detailed observation with an optical microscope and an electron microscope of the surface of the rear head LUL durability test, but no damage or the like was observed abnormalities stains, but also was not observed adhesion lubricant to the magnetic head, or corrosion damage, good condition. 而且，为了评价温度特性，在_20°C~50°C的氛围下进行LUL耐久性试验，本实施例的磁盘没有发生故障，获得了良好的结果。  Further, in order to evaluate the temperature characteristic, LUL durability test was conducted in an atmosphere of _20 ° C ~ 50 ° C, the magnetic disk of the present embodiment is not failed, to obtain good results. 用GPC法对作为市售的全氟聚醚系润滑剂的y4yu夕シ只社制造的7才y7、'卩yZ-DOL(商品名）进行分子量分级，使用Mw为2000,分子量分散度为1. 08的级分作为润滑剂，使其分散溶解在作为氟系溶剂的三井r >7口口力；P社制造的只一卜U少XF(商品名）中，制成涂布液，对成膜至保护层的磁盘进行浸渍，并通过利用浸涂法涂布，使润滑层成膜。  GPC method using commercially available perfluoropolyether-based lubricant y4yu Xi Silicone 7 was manufactured only y7, 'Jie yZ-DOL (trade name), molecular weight fractionation, Mw of 2000, a molecular weight dispersion degree of 1.08 as a lubricant fraction, dissolved and dispersed in a fluorine-based solvent Mitsui r> 7 mouth force; P, manufactured by only a few U Bu XF (trade name), a coating made solution, forming the disk to the protective layer is impregnated and coated by using a dip coating method, the lubricating layer deposition. 其中，适当调整上述涂布液的浓度，按润滑剂覆盖率与实施例1的磁盘基本相同来成膜。 Wherein, appropriately adjusting the concentration of the coating solution, the disk of Example 1 was substantially identical to the embodiment of the film formation by the lubricant coverage. 润滑层的膜厚为17又。 Thickness of the lubricating layer 17 has. 将除此之外与实施例1相同方式制造的磁盘作为比较例。  The same manner as in Example except that the disk 1 is manufactured as a comparative example embodiment. 接着，通过使上述市售的润滑剂中存在20%氧化铝（Al2O3)，在氮气（N2)气氛下， 比实施例更低的200°C的恒温下，使之保持500分钟，进行热重量分析。  Next, the presence of 20% alumina (Al2O3) by bringing the commercially available lubricants, under nitrogen (N2) atmosphere, than at a constant temperature to 200 ° C lower embodiment of the embodiment, so that for 500 minutes. thermal gravimetric analysis. 将对上述以往的润滑剂的耐氧化铝性进行评价试验的结果示于图1。 The results of the above-described conventional aluminum resistance will lubricants evaluation test is shown in FIG. 添加氧化铝时的衰减率（以图中的点划线（加了Al2O3的Z-D0L)表示的曲线）为90%以上，非常大（不添加氧化铝时的衰减率为约60% )，上述比较例涉及的润滑剂容易引起由氧化铝导致的分解，低分子化的可能性高。 Adding alumina decay rate (dot-dash line in the figure (Al2O3 added is Z-D0L) represented by the curve) of more than 90%, is very large (decay rate was not added when about 60% alumina), a lubricant according to the comparative example is easy to cause decomposition of the resulting aluminum oxide, a high molecular weight of possibilities. 此外，以与实施例相同的方式进行LUL耐久性试验的结果是，本比较例的磁盘，在5nm的超低上浮量下，40万次时发生故障。  Further, the results of LUL durability test in the same manner as in Example embodiment, the magnetic disk of the present comparative example, in the ultra-low flying height of 5nm, 400,000 fault occurs. 用光学显微镜和电子显微镜详细观察LUL耐久性试验后的磁盘表面，结果观察到若干损伤等。 Disk surface was observed in detail after the LUL durability test by an optical microscope and an electron microscope, a number of injury was observed. 此外，用光学显微镜和电子显微镜详细观察LUL耐久性试验后的磁头表面，观察到润滑剂向磁头的附着和腐蚀损害。 In addition, the head surface was observed in detail after the LUL durability test by an optical microscope and an electron microscope, the magnetic head is observed to lubricant adhesion and corrosion damage. 以与实施例1相同方式，成膜附着层、软磁性层、第1基底层、第2基底层、磁性层及碳系保护层，再用与实施例1相同的润滑剂在保护层上成膜润滑层。  In the same manner as in Example 1, the film-forming adhesion layer, a soft magnetic layer, a first base layer, second base layer, a magnetic layer and a carbon-based protective layer, and then the same as in Example 1 in a protective lubricant embodiment forming a lubricating layer on the layer. 成膜后，对磁盘实施130°C，90分钟的加热处理和紫外线照射。 After deposition, the disk embodiment 130 ° C, the heat treatment and the ultraviolet irradiation for 90 minutes. 而且，用光强度比为波长185nm:波长254nm= 2:8的紫外线灯，照射时间在20秒以内，进行该紫外线照射。 Further, the light intensity ratio of 185nm wavelength: Wavelength 254nm = 2: 8, the ultraviolet lamp, the irradiation time of 20 seconds, and the ultraviolet irradiation. 用傅立叶变换型红外分光光度计（FTIR)测定润滑层的膜厚，得出膜厚为12羞。 Lubricant layer film thickness measurement with a Fourier transform infrared spectrophotometer (FTIR), to obtain a film thickness of 12 shame. 润滑层覆盖率在80 %以上为良好。 Lubricating layer coverage of 80% or more as well. 这样， 得到了实施例2的磁盘。 In this way, the magnetic disk of Example 2. 接着，用与实施例1相同的方式，进行实施例2的磁盘的LUL耐久性试验，结果实施例2的磁盘在5nm的超低上浮量下耐久至无障碍90万次的LUL动作。  Next, in the same manner as in Example 1, a magnetic disk LUL durability test of Example 2, Example 2 of the disk accessible to 900,000 durable under extremely low flying height of 5nm results of the operation of LUL . 可以是说实施例2的磁盘具备极高的可靠性。 May be said that a disk of Example 2 with a high reliability. 用光学显微镜和电子显微镜详细观察LUL耐久性试验后的磁盘表面，但没有观察到损伤或污渍等异常，状态良好。 Disk surface was observed in detail after the LUL durability test by an optical microscope and an electron microscope, were observed but no damage such as stains or abnormal, in good condition. 此外，用光学显微镜和电子显微镜详细观察LUL耐久性试验后的磁头表面，但没有观察到损伤或污渍等异常，而且，也没观察到润滑剂向磁头的附着，或腐蚀损害，状态良好。 Further, detailed observation with an optical microscope and an electron microscope of the surface of the rear head LUL durability test, but no damage or the like was observed abnormalities stains, but also was not observed adhesion lubricant to the magnetic head, or corrosion damage, good condition. 按照前述合成图通过以下方式制造前述例示的No. 2的润滑剂化合物。  Synthesis of the preceding embodiment shown in FIG producing the lubricant No. Compound 2 in the following manner. 通过在碱性条件下（NaOH)，使前述具有环氧基和芳香基的化合物与分子中具有全氟聚醚主链且在两末端具有羟基的全氟聚醚化合物（参照前述合成图）反应来制造。  under basic conditions by (NaOH), so that the molecule with a compound having an epoxy group and an aromatic group having a perfluoropolyether main chain, and a perfluoropolyether compound having hydroxyl groups at both ends (see the synthesis of FIG) reaction. 以与实施例1相同的方式，从附着层成膜至软磁性层、第1基底层、第2基底层、磁性层和碳系保护层。  In the same manner as in Example 1, from adhering to the layer forming the soft magnetic layer, a first base layer, second base layer, a magnetic layer and a carbon-based protective layer. 接着，按如下方式形成润滑层。  Next, a lubricant layer is formed as follows. 制备使润滑剂（使用NMR法测定的Mn为4200,分子量分散度为L10)以0• 2重量％的浓度分散溶解在作为氟系溶剂的三井r>7口口力；P社制造的只一卜b 少XF(商品名）中的溶液，该润滑剂由按上述方式制造且通过超临界提取法进行了分子量分级的本发明的润滑剂（前述例示化合物No. 2)构成。  Preparation of lubricant (Mn measured by using the NMR method is 4200, a molecular weight dispersion L10) at a concentration of 0 • 2% by weight of dispersed and dissolved in a fluorine-based solvent Mitsui r> 7 mouth force; manufactured P b Bu only a few XF (trade name) was the lubricant from the lubricant manufacturer manner described above and the molecular weight was fractionated by supercritical extraction method of the present invention (the exemplified compound No. 2) constituted. 将该溶液作为涂布液，对成膜至保护层的磁盘进行浸渍，通过浸涂法涂布，使润滑层成膜。 This solution as a coating solution for forming the protective layer to the magnetic disk is impregnated by dip coating method, a lubricating layer was formed. 成膜后，在与实施例2相同条件下对磁盘实施加热处理和紫外线照射。  After the deposition, in the same conditions as in Example 2 under the disk embodiment heating treatment and ultraviolet irradiation. 用傅立叶变换型红外分光光度计（FTIR)测定润滑层的膜厚，得出膜厚为12,4。 Lubricant layer film thickness measurement with a Fourier transform infrared spectrophotometer (FTIR), to obtain a film thickness of 12,4. 润滑层覆盖率在80%以上为良好。 Lubricating layer coverage of 80% or more as well. 这样，得到了实施例3的磁盘。 In this way, the magnetic disk of Example 3. 接着，进行实施例3中使用的上述润滑剂的耐氧化铝性评价试验。  Next, an alumina resistance evaluation test of the lubricant of Example 3 was used. 与实施例1同样，通过使上述润滑剂中存在20%氧化铝（Al2O3)，在氮气（N2)气氛下，250°C的恒温下，使之保持500分钟，进行热重量分析。  Similarly to Example 1, by the presence of 20% alumina (Al2O3) of the lubricant, under nitrogen (N2) atmosphere, to 250 ° C at a constant temperature, so that for 500 minutes, and thermal gravimetric analysis. 其结果是，本实施例中使用的本发明涉及的润滑剂在添加氧化铝时的衰减率为约30%以下，这表明了优异的耐氧化铝性， 即难以发生由氧化铝导致的分解。 As a result, the lubricant of the present invention used in the present embodiment is directed to the attenuation ratio when alumina is added to about 30% or less, which indicates excellent alumina, i.e. alumina, is unlikely to occur due to decomposition. 此外，还显示了不添加氧化铝时的衰减率为约10%以下， 耐热性优异。 In addition, the attenuation rate is also displayed when no alumina was added to about 10% or less, excellent in heat resistance. 接着，用与实施例1相同的方式，进行实施例3的磁盘的LUL耐久性试验，结果实施例3的磁盘在5nm的超低上浮量下耐久至无障碍90万次的LUL动作。  Next, in the same manner as in Example 1, a magnetic disk LUL durability test of Example 3, Example 3 of the magnetic disk accessible to 900,000 durable under extremely low flying height of 5nm results of the operation of LUL . 可以确认实施例3的磁盘具备极高的可靠性。 Example 3 confirmed embodiment of the magnetic disk with a high reliability. 用光学显微镜和电子显微镜详细观察LUL耐久性试验后的磁盘表面，但没有观察到损伤或污渍等异常，状态良好。 Disk surface was observed in detail after the LUL durability test by an optical microscope and an electron microscope, were observed but no damage such as stains or abnormal, in good condition. 此外，用光学显微镜和电子显微镜详细观察LUL耐久性试验后的磁头表面，但没有观察到损伤或污渍等异常，而且，也没观察到润滑剂向磁头的附着，或腐蚀损害，状态良好。 Further, detailed observation with an optical microscope and an electron microscope of the surface of the rear head LUL durability test, but no damage or the like was observed abnormalities stains, but also was not observed adhesion lubricant to the magnetic head, or corrosion damage, good condition. 按照前述合成图通过以下方式制造前述例示的No. 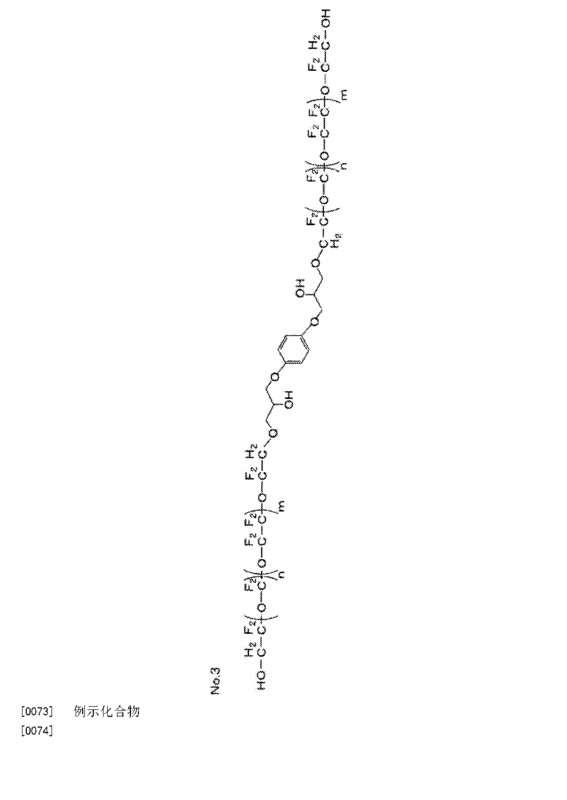 5的润滑剂化合物。  Synthesis of the preceding embodiment shown in FIG producing the lubricant No. Compound 5 in the following manner. 通过在碱性条件下（NaOH)，使间苯二酚二缩水甘油醚与分子中具有全氟聚醚主链且在两末端具有羟基的全氟聚醚化合物（参照前述合成图）反应（其中，使3当量上述全氟聚醚化合物与间苯二酚二缩水甘油醚进行反应）来制造。  under basic conditions by (NaOH), and resorcinol diglycidyl ether having in the molecule and a perfluoro polyether backbone a perfluoropolyether compound having hydroxyl groups at both ends (with reference to the FIG Synthesis) the reaction (wherein the 3 equiv above perfluoropolyether compound is reacted with resorcinol diglycidyl ether) produced. 制备使润滑剂（使用NMR法测定的Mn为3600,分子量分散度为L10)以0• 2重量％的浓度分散溶解在作为氟系溶剂的三井r >7口口力；P社制造的只一卜b 少XF(商品名）中的溶液，该润滑剂由按上述方式制造且通过超临界提取法进行了分子量分级的本发明的润滑剂（前述例示化合物No. 5)构成。  Preparation of lubricant (Mn measured by using the NMR method 3600, a molecular weight dispersion L10) at a concentration of 0 • 2% by weight of dispersed and dissolved in a fluorine-based solvent Mitsui r> 7 mouth force; manufactured P b Bu only a few XF (trade name) was the lubricant from the lubricant manufacturer manner described above and the molecular weight was fractionated by supercritical extraction method of the present invention (the exemplified compound No. 5) configured. 将该溶液作为涂布液，对成膜至保护层的磁盘进行浸渍，通过浸涂法涂布，使润滑层成膜。 This solution as a coating solution for forming the protective layer to the magnetic disk is impregnated by dip coating method, a lubricating layer was formed. 成膜后，在与实施例2相同条件下对磁盘实施加热处理和紫外线照射。  After the deposition, in the same conditions as in Example 2 under the disk embodiment heating treatment and ultraviolet irradiation. 用傅立叶变换型红外分光光度计（FTIR)测定润滑层的膜厚，得出膜厚为12A。 Lubricant layer film thickness measurement with a Fourier transform infrared spectrophotometer (FTIR), to obtain a film thickness of 12A. 润滑层覆盖率在80% 以上为良好。 Lubricating layer coverage of 80% or more as well. 这样，得到了实施例4的磁盘。 In this way, the magnetic disk of Example 4. 接着，进行实施例4中使用的上述润滑剂的耐氧化铝性评价试验。  Next, an alumina resistance evaluation test in Example 4 of the lubricant used. 与实施例1同样，通过使上述润滑剂中存在20%氧化铝（Al2O3)，在氮气（N2)气氛下，250°C的恒温下，使之保持500分钟，进行热重量分析。  Similarly to Example 1, by the presence of 20% alumina (Al2O3) of the lubricant, under nitrogen (N2) atmosphere, to 250 ° C at a constant temperature, so that for 500 minutes, and thermal gravimetric analysis. 其结果是，本实施例中使用的本发明涉及的润滑剂（例示No. 5)在添加氧化铝时的衰减率为约30%以下，这表明了优异的耐氧化铝性，即难以发生由氧化铝导致的分解。 As a result, the lubricant used in the present invention according to the present embodiment (shown in Example No. 5) was attenuated when adding alumina to about 30% or less, which indicates excellent alumina, i.e. hardly occurs by the due to the decomposition of alumina. 此外，还显示了不添加氧化铝时的衰减率为约10%以下，耐热性优异。 In addition, the attenuation rate is also displayed when no alumina was added to about 10% or less, excellent in heat resistance. 接着，用与实施例1相同的方式，进行实施例4的磁盘的LUL耐久性试验，结果可以确认在5nm的超低上浮量下耐久至无障碍90万次的LUL动作，实施例4的磁盘具备极高的可靠性。  Next, in the same manner as in Example 1, a magnetic disk LUL durability test of Example 4, it was confirmed to durable accessibility of 900,000 LUL operation under extremely low flying height of 5nm, embodiments disk 4 with a high reliability. 用光学显微镜和电子显微镜详细观察LUL耐久性试验后的磁盘表面，但没有观察到损伤或污渍等异常，状态良好。 Disk surface was observed in detail after the LUL durability test by an optical microscope and an electron microscope, were observed but no damage such as stains or abnormal, in good condition. 此外，用光学显微镜和电子显微镜详细观察LUL耐久性试验后的磁头表面，但没有观察到损伤或污渍等异常，而且，也没观察到润滑剂向磁头的附着，或腐蚀损害，状态良好。 Further, detailed observation with an optical microscope and an electron microscope of the surface of the rear head LUL durability test, but no damage or the like was observed abnormalities stains, but also was not observed adhesion lubricant to the magnetic head, or corrosion damage, good condition. 1. 磁盘用润滑剂化合物，其是一种基板上至少依次设置了磁性层、保护层以及润滑层的磁盘的前述润滑层中含有的润滑剂化合物，其特征在于，该润滑剂化合物由结构中具有全氟聚醚主链，且在除分子末端以外的位置上具有芳香族基，并且在分子的末端具有极性基的化合物构成， 其中所述芳香族基选自苯基、亚萘基、亚联苯基、邻苯二甲酰亚胺基和苯胺基， 其中所述润滑剂化合物在芳香族基两侧和附近还具有极性基，并且其中所述化合物的每一极性基选自氨基、羧基、醛基、羰基和磺酸基。 1. Disk lubricant compound, which in turn is disposed on at least one kind of the substrate the compound lubricant lubricating layer of the magnetic layer, a protective layer and a lubricating layer disk contained, wherein the lubricant is a compound represented by the structure having a perfluoropolyether main chain and having an aromatic group at a position other than the end of the molecule, and a compound having a polar group at the end of the molecule constituting, wherein said aromatic group is selected from phenyl, naphthylene, biphenylene, phthalimido group and an anilino group, wherein said lubricant further compound having a polar group in the vicinity of both sides and an aromatic group, a polar group and wherein each of said compound is selected from an amino group, a carboxyl group, an aldehyde group, a carbonyl group, and a sulfonic acid group. 2. 权利要求1中所述的磁盘用润滑剂化合物，其特征在于，所述化合物的一个分子中的极性基的数量为7个以下。 The disk of claim 1, wherein the lubricant compound, a quantity of the compound molecule a polar group is 7 or less. 3. 权利要求1中所述的磁盘用润滑剂化合物，其特征在于，前述化合物的数均分子量在1000 - 10000的范围。 The disk of claim 1, wherein the lubricant compound, the number average molecular weight compound 1000-- range 10,000. 4. 在基板上至少依次设置了磁性层和保护层以及润滑层的磁盘，其特征在于，前述润滑层含有权利要求1所述的磁盘用润滑剂化合物。 4. On the disk substrate is provided with at least a magnetic layer and a protective layer and a lubricating layer, wherein the lubricating layer comprising the magnetic disk as claimed in claim 1, with a compound of the lubricant. 5. 权利要求4所述的磁盘，其特征在于，所述保护层是通过等离子体CVD法成膜的碳系保护层。 5. The disk according to claim 4, characterized in that the protective layer is a carbon-based protective layer is formed by a plasma CVD method. 6. 权利要求5所述的磁盘，其特征在于，所述保护层在与前述润滑层接触侧含有氮。 6. The disk according to claim 5, characterized in that the protective layer is in contact with the nitrogen-containing lubricating layer side. 7. 权利要求4所述的磁盘，其特征在于，其为搭载于起动停止机构为加载卸载方式的磁盘装置中的磁盘。 7. The disk according to claim 4, characterized in that the start-stop mechanism for the disk loading and unloading apparatus of the embodiment is mounted on the disk. 8. 在基板上至少依次设置了磁性层和保护层以及润滑层的磁盘的制造方法，其特征在于，使包含权利要求1所述的磁盘用润滑剂化合物的润滑剂组合物在前述保护层上成膜而形成前述润滑层。 8 is provided with at least the magnetic layer and the protective layer and a method of manufacturing a magnetic disk lubricant layer on a substrate, wherein the magnetic disk according to claim comprising a protective layer on the lubricant the lubricant composition of the compound forming the lubricating layer is formed. 9. 权利要求8所述的磁盘的制造方法，其特征在于，在前述润滑层成膜后，对前述磁盘实施紫外线照射，或者实施紫外线照射和加热处理两者。 9. A method of manufacturing a magnetic disk according to claim 8, wherein, after forming the lubricating layer, ultraviolet irradiation on the disk embodiments or embodiments both ultraviolet irradiation and heat treatment. Free format text: FORMER OWNER: HOYA MAGNETICS SINGAPORE PTE. LTD. Owner name: WESTERN DIGITAL MEDIA (SINGAPORE) CO., LTD.
Free format text: FORMER OWNER: HOYA CORP.